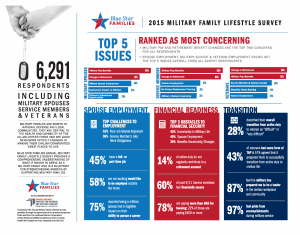 Last week, Blue Star Families released the results of their latest Military Lifestyle Survey to give voice to the many military families that raise their hands to serve alongside their service member. This report provides critical insight into the needs and priorities of these families, so that the nation can better support them. The survey is an annual joint effort between Blue Star Families and the Institute for Veterans and Military Families. During the survey launch on Capitol Hill, speakers from USAA, Blue Star Families staff members and Congressional leaders discussed the importance of recognizing and supporting military families. When someone joins the military, their spouses, children and other family members share this experience. Overall, one of the top concerns among Blue Star Family survey respondents was the uncertainty associated with the military lifestyle, including the uncertainty of job security, retirement benefits, financial security and future employment for both service members and their spouses. 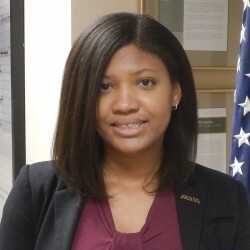 Military spouses often struggle with financial and career challenges related to regular PCS moves and other uncertainties of the military lifestyle. Among respondents to the Blue Star Family Survey, more than half of active duty spouses who were not working wanted to be employed (58%). The majority also reported that being a military spouse had a negative impact on their ability to pursue employment (75%). However, in spite of facing some challenges, military families are highly engaged in their communities. More than 70 percent donated to charitable organizations in the last 12 months, 65 percent have volunteered in the past year and of those, 70 percent volunteered in their civilian communities. These findings indicate that investing in the well-being and success of military families can benefit local communities and nation as a whole. The Military Lifestyle survey is an important effort that ultimately helps our nation’s leaders and policy makers determine which services, programs and resources are available to best serve military families. Our veterans, military service members and their families will continue to need the support of our nation as more veterans return home in the years ahead.